The Federation of Terran Nations or FTN, is the central Government of Earth and its Colonies. The FTN is made up by the Federal Central Core (with its own Fleet, Navy, Infantry and Security Service) and National Military units. The FCC holds power over all Nations and Colonies by a use of subversion, bribery and fear. Each Nation and Colony has its own unique Military with national flavor, this military is subservient to the FCC. FTN controlled areas are generally well off with decent standards of living and although dystopian and authoritarian most citizens are happy to serve under the FCC due to the external threats from the Hives as well as the Unruled. Hives are a dangerous alien race of cephalopods with a hard exoskeleton from which their tentacles withdraw or protrude that has recently spread over FTN space including Earth. Hive seeds were first encountered drifting in space from the galactic core by a deep research vessel 'The Repulsion'. Contact with the Repulsion was soon lost and rescue missions encountered a scene of horror and death. After loosing two rescue crews, the Repulsion was recovered and taken back to the nearest colony 'Evergreen'. Within a month the population of Evergreen was launching away from the hell that was engulfing the planet. Unfortunately FTN researchers suggest that so many of these craft were infected and the space crafts spread the problem to nearby systems. The Hive spread to most of the FTN including earth, almost half the population of the FTN was destroyed before the Hive was eradicated, however there are many dead worlds that are still contaminated and rumored to be hundreds maybe thousands of dead space craft drifting in FTN space. They seem to have an insect like intelligence and seed an area then devour all life, once the food source is exhausted the Hive enters a hibernation sleep. Advanced Intelligence? There are rumors that the Hive is controlled by an elite that has so far remained out of contact. The Unrulled is a generic term applied to an eclectic mix of anarchist, mutants, pirates, traders and Colonies not under the rule of the FTN. There is no overall leader and often these groups are fighting or raiding each other and pose no threat to the FTN who mostly tolerate Unrulled as long as they dont cause to much damage or threaten their power base. The Unrulled can be found everywhere including on earth. The Acturians are a short vicious race from the HiGrav planet Actur. The Acturians have a love of chaos and discord, perfect pirates! Actur has long been destroyed by the Hives and now the remaining Acturians prowl the dead space looking for easy targets to pirate in a mish mash of colossal colony ships and tiny scout craft. The FTN offer a bounty on Acturians dead or alive and an Acturians status is enhanced by a high bounty. Acturians hate the Hive with a passion. 20mm Sci-Fi Elhiem x4 Acturian Pirate Captains with Ripper Guards. The Acturians are a short vicious..
20mm Sci-Fi Elhiem x4 Acturian Pirate Cleb Soldiers The Acturians are a short vicious race from the ..
20mm Sci-Fi Elhiem x4 Acturian Pirate Nobles. 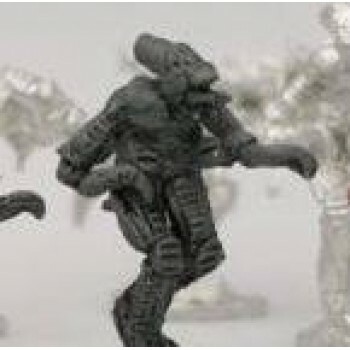 The Acturians are a short vicious race from the HiGrav..
20mm Sci-Fi Elhiem x4 Acturian Pirate Rippers. The Acturians are a short vicious race from the HiGra..
20mm Sci-Fi Elhiem x2 FED Troopers in Medium Body Armour support gunner armed with R56 Combat Carbin..
20mm Sci-Fi Elhiem x3 Armoured Fed Troopers with PT89 Thumper Rifles in battle order. The PT89 packs..
20mm Sci-Fi Elhiem x3 High Status FCC Females, diplomats, Commanders etc..
20mm Sci-Fi Elhiem x3 Bandit band/leaders/preachers Out in the wastes these. These figures are based..
20mm Sci-Fi Elhiem x4 FED Security with sealed helmets FCC security personel with sealed helmets as ..
20mm Sci-Fi Elhiem X10 Mixed Hive Adults Hornets selection is random and will have repeats. Hive Adu..
20mm Sci-Fi Elhiem x10 Hive seed pods are destroyed or burst. Seeds can survive deep space and survi..
20mm Sci-Fi Elhiem x10 Hive Larvae, hungry and nimble. The Hive Larvae are essentialy miniature vers..
20mm Sci-Fi Elhiem x10 10x Hive seed pods are to be destroyed on sight. Seeds can survive deep space..
20mm Sci-Fi Elhiem x3 National Infantry with Mk6 Rifles. The FTN is made up of hundreds of Plantet N..